Aging is a natural process that catches up to us at some point and changes in certain parts of our body are evidence of that. The eyes are one of such places. Having wrinkled dry eyes is no fun, thus the reason why some people use eye creams to soothe and hydrate it. LifeLine Eye Firming Complex is a product that has been designed to help you with that. Let us take a look an in-depth look into the property and what it has to offer to you. 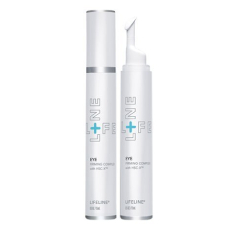 What is LifeLine Eye Firming Complex? This is an eye cream that has been designed to aid in the reduction of the visible signs of aging while also soothing and hydrating the eye region. The product makes use of peptides gotten from multi-potent non-embryonic human stem cells. The cream aims to eliminate the visible effects of aging in the eye region soothing it, hydrating, tightening, and lifting the region. When these functions combine, they are expected to reduce the wrinkles in the eyes and make the user look younger. Who Is The Manufacturer of Lifeline Eye Firming Complex? The parent company of this product is Life Line Stem Cell Skin Care. The company is a reputable one that combines scientific technology with highly advanced ingredients. They are looking to encourage more people to go for a more resilient, youthful skin. The company also manufactures other products such as cleansers that help improve the skin condition. The manufacturer claims that the Lifeline eye firming cream is sufficient to drastically slow down the visible effects of aging around the eyes. Life Line Stem Cell Skin Care claims that it makes use of new absorption and molecular technologies that deliver advanced anti-aging ingredients, the like that has never been seen before. How Does Lifeline Eye Firming Complex Work? LifeLine Eye Firming Complex Ingredients – Are they Safe & Effective? This is the primary ingredient and it stimulates collagen production. It also leads to the production of elastin and hyaluronic acid which when combined, could be vital to the ability of your body to repair the damaged cells around the eyes. This is a powerful anti-oxidant which is believed to reduce skin damage caused by UV rays. It also aids in reducing fines lines and wrinkles on the skin by enhancing the production of collagen. It aids in replenishing body moisture which leads to naturally plump skin and reduces the appearance of dark circles around the eyes. Other ingredients present include Deionized Water, Ethylhexyl Palmitate, Cetearyl Alcohol, Cocos Nucifera (Coconut) Oil, Caprylic/Capric Triglyceride, Caffeine, Sodium Starch Octenylsuccinate, and many more. What are the Advantages of LifeLine Eye Firming Complex? It may help in improving skin smoothness with its humectant feature. The production of collagen might reduce fine lines and wrinkles. What are the Disadvantages of LifeLine Eye Firming Complex? The product has a few reviews claiming it doesn’t perform the eye firming function. Lifeline eye firming complex is said to be pricey. How should you use lifeline eye firming complex? The company recommends the cream to be used in the morning and evening. 1 pump should be dispensed and spread evenly right above the cheekbone and below the brow. You should tap on the applied area until it is fully absorbed. How much does Lifeline eye firming complex cost? The product retails for $89. You can subscribe to it and save 20%, with the manufacturers charging only $71.20 for that. What is Lifeline eye firming complex’s Return Policy? The company doesn’t have a return policy for this cream. You can, however, decide to sample it before making any commitments. Does Lifeline eye firming complex offer a free trial? Yes, there is. The company offers a sampling of the product before making any commitment. No obligation, and no automatic-reorders when you sample their product. You can request for four products to try by completing a form on their website and is available to only U.S residents. Each of the samples comes with a 10% off coupon for your future use. The company charges you only $1 to mail you the product. This product may be able to reduce the visible the signs of aging around your eyes while also firming them up. The ingredients used in the production of Lifeline eye firming complex are believed to have numerous features to aid with eye firming and wrinkle reduction. Despite the raving reviews it has received, it is recommended that you consult with your dermatologist before you start using the cream.